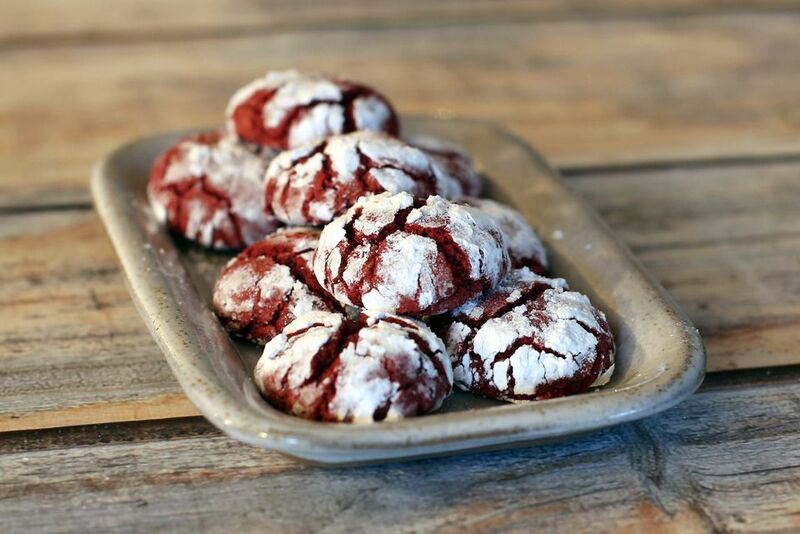 Bake these beautiful red velvet crinkles for the holidays or any occasion. The bright red color makes the cookies perfect for Valentine's Day and Christmas, or bake some over the weekend for a fabulous treat. In a bowl, combine the flour, cocoa powder, baking powder, and salt. Stir or whisk to blend thoroughly. In a large mixing bowl with an electric mixer, beat the butter and sugar until light and fluffy. Beat in the eggs, vanilla extract, and food coloring* until smooth and well blended. *Gel and paste food coloring is more concentrated than liquid. Add a little at a time until your batter is a nice deep red color. With the mixer on low speed, add the flour and cocoa mixture to the batter. Blend well. Chill the dough for at least 2 to 4 hours, or until it is quite firm. Heat the oven to 350° F (180° C/Gas 4). Line a large baking sheet with parchment paper or spray with nonstick baking spray. Shape the dough into small balls about 1 inch in diameter and place on the prepared baking sheet about 1 1/2 inches apart. Once you have filled the baking sheet, roll the balls, one or two at a time, in the sifted powdered sugar and place them back on the baking sheet. Bake for about 10 to 12 minutes, or until they are set and have that signature crinkled look. Let the cookies cool in the pan for 4 or 5 minutes, then remove to a rack to cool completely. Repeat with the remaining dough.